The root canals in your teeth are the tiny passages that travel from your roots to your pulp chamber. Each tooth has a pulp chamber made up of living connective tissue. 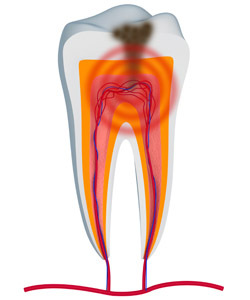 The nerves that allow you to experience hot and cold travel through the root canals to the center of your tooth. When a tooth infection reaches the tooth pulp, it can affect these nerves and cause a serious, chronic toothache. A root canal, or root canal therapy, refers to a procedure that is used to save teeth that have experienced this kind of tooth infection. Patients who need a root canal often experience a serious, chronic toothache that can make day-to-day life difficult. A root canal will relieve your toothache and alleviate your other symptoms. After a root canal, you’ll be able to feel comfortable again. Before root canals were available, when an infection reached the tooth pulp, the infected tooth had to be extracted. We can save more teeth and help smiles last even longer with root canal therapy. The infection in your tooth can spread if it is left untreated. A root canal prevents infection from spreading to your other teeth and prevents the infection from traveling to your bloodstream, where it could potentially cause serious health problems. Root canals are capped with porcelain crowns that will protect your teeth from future damage or decay. After your tooth is prepared for your root canal, your dentist will begin by removing the infection and infected tissue from your tooth. Your tooth will be sterilized and medicated to promote healing and to prevent future infection. Once your root canal is complete, your dentist will restore your remaining tooth structure with one of our beautiful porcelain crowns.